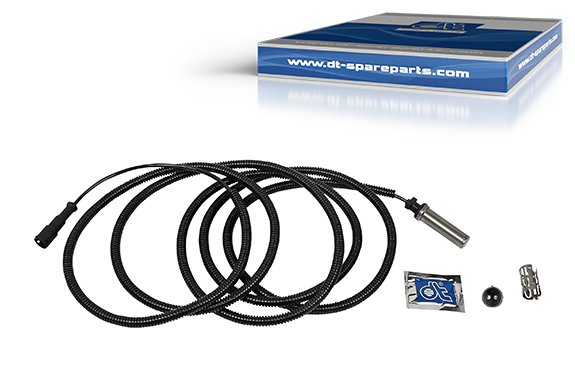 The 4.63786 ABS sensor is characterized by its high-quality workmanship, making it built to last. The sensor head has a corrosion-resistant, stainless steel sleeve. It is connected to the synthetic sensor head, which has the induction coil moulded into it in a way that is both shockproof and insulating. A synthetic corrugated tube protects the sensor cable from damage. Even the connector offers lasting protection against environmental influences, thanks to its silver-coated contacts, designed for low contact resistance. The complete set comes with assembly grease and a clamping sleeve suitable for assembly. The sensor head’s assembly supports must be cleaned before assembly of the new ABS sensor, and all rust must also be removed using sandpaper. The clamping sleeve must be greased using the enclosed assembly grease. Only then can the sensor be pressed as far as it will go into the ABS ring using the grease. The ease with which the sensor goes into the bearing sleeve is important, as the axial eccentricity of the ABS ring sets the necessary clearance. The sensor cable and the corrugated tube must be assembled without tension, so that the cable ties do not damage or bend the sensor cable. The supporting cabling must lock in place during assembly of the contact plug, so as to prevent moisture penetration.